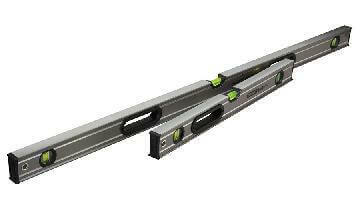 Fantastic bit of kit, Great for marking out long runs for clips, chases and pipework drops etc. I've had mine a few years now and I honestly wouldn't be without one. Brilliant bit of kit. i cant believe i went so long without one. once i got mine i thought it was great how many different jobs i could make easier by using it. I highly recommend this excellent value laser. I have been using this model for years and find it a great aid for setting out timber stud walling. I also use it in cross mode for tiling. It has three settings; vertical line, horizontal line and cross lines. Another useful feature is the magnetic bracket it comes with. This a great piece of kit and I’ve been using mine regularly for 3 years to mark our recessed downlights in ceilings. Green laser wasn’t available at time of purchase, but I would recommend getting the green one if using outside or in bright conditions. Other than that this red line one is great just get the glasses. This laser is so easy to use and you really csn see what you are doing.great value and great product. One of the Best lasers on the market for the Price. 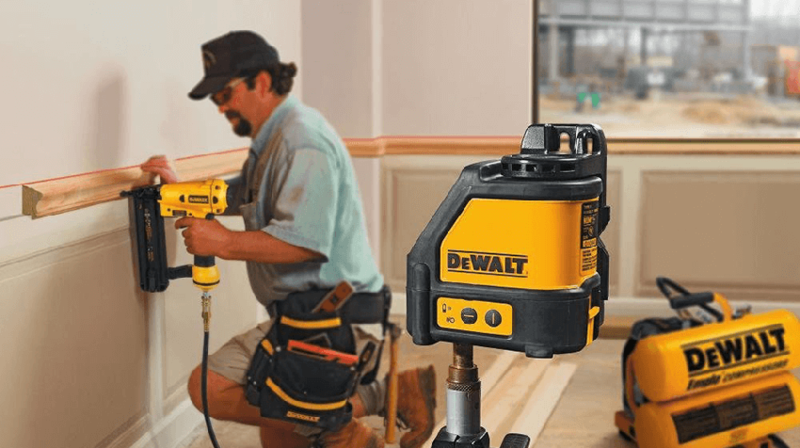 Touygh and robust as you would expect from dewalt. Comes i n a tough blow moulded case to protect it when in transit and on site. Battery life is very good with a warni ng so you know when there running low. Great bits of kit for Kitchen fitting, Tiling fitting false ceilings and stud walls. Very handy red cross laser level. Can select between horizontal and vertical or both via individual buttons. Powered by 3 AA batteries which comes in a tough little case that also has a multi surface attachment. The laser unit itself is magnetic which means it can be stuck straight to most metal surfaces or you can use the bracket it comes with. I find the laser sufficient for 10 meters in a lit room, might get further in a dark one. Handy for hanging radiators and getting pipework straight over a long length. The base also has a tripod point which means it's can be used anywhere a tripod can be located. Best investment I made, have had for 5 years and still going strong. Very robust and versatile. Fantastic laser level. I have recently upgraded to this from a cheaper brand. I did consider the brighter green laser but ended with the cheaper red one. The red laser level is incredibly bright indoors. Very happy with my purchase. I have the green laser. It’s a mid price laser level and I think it’s is great for the cost well worth the money, after I purchased it I haven’t stopped using it for first fixes. The green really helps when working on fresh plaster also. Over all great bit of kit also self levelling. this laser level is one of the best cheap laser levels on the market. the magnet on the back is very strong. have found that the laser does turn off on its own a lot when putting down on the floor i think this is a issue with the battery connection. Like my level .mine came with a free t stack box to , I don’t really buy de Walt stuff but needed a level , love the fact you can stick it to things with it’s magnetic strip on the back. Used this in my previous job, found it very good and very keenly priced if you shop around a bit. I actually bought the multi line version of this when I made my own purchase. But the 3rd kind is not practical for an electrician. If you require use outside I would further recommend the green version. Fundamental part of our tool kit for marking out. From recessed lights, kitchens and tray hangers makes work quick and easy with bang on results! It’s essential for me to have a good laser level as I do a lot of floor screeding. This is tough, easy to use the price is very fair. A very good laser level, wouldn't be without it now on tiling jobs, comes in very handy for long pipe runs aswell, once it's set up, you can forgot about it, it does the rest! Very robust ideal for domestic use and general commercial. As an electrician I find this a must have for everyday use, it makes most Electrical tasks a lot faster and more precise. I have come across kitchen fitters, plumbers and general joiners all using them for all sorts of tasks. Best value for money on the market, meets all general tasks without the need for 100m laser! 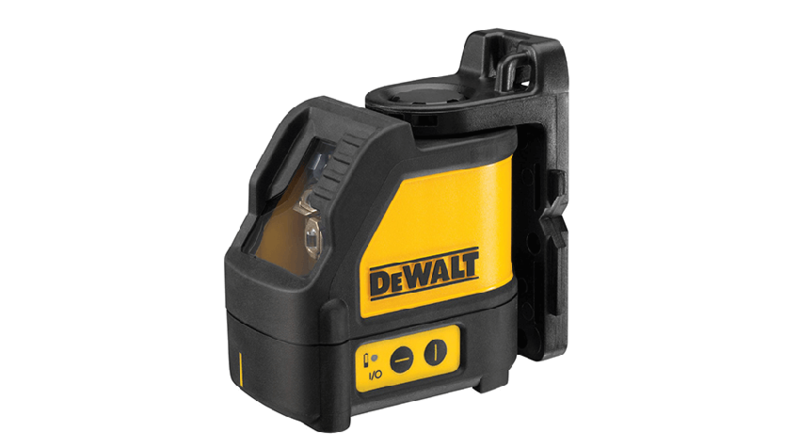 I’ve had my Dewalt laser now for 4 years. Again not sure how I’ve ever lived without it. Easy and simple to use! Batteries last a long time especially if you use a decent brand or industrial ones. Always a good call to keep an eye on the levels and make sure they don’t require re calibrating. Excellent bit of kit. Simple to set up and use. Really accurate in both axis. Top quality and durable. Essential for kitchen fitting, tiling etc. Highly recommend this specific one as it out classes other similar types I’ve used in the past. Great tool would be lost without it. Easily used and goes a great distance. Definitely worth a buy for anyone. Had this 6 months now, absaloutly brilliant. Clear line, easy to fix to walls and sticks to metal cornertape that has been plastered over! Top quality product rugged ideal for most tasks. Easy to use and good value for money. Sometimes laser beam not powerful enough when in bright light conditions. Brilliant build quality! Dropped it off some stuff before and still works like new! Good distance for the laser line as well. Anybody that works on any of the new sites will understand how helpfu these can be. They will go on almost every single wall due to tin studs and the range is phenomenal! Absolutely love this laser level. Saves me so much time and it makes installing boxes incredibly easy. Highly recommend it. Great little laser level . Comes in it own carry case to protect from any unwanted bangs and bumps . Does exactly what it's supposed to to , give you straight level lines exactly where you want them . Very good laser level with accurate lines. Good for carrying out tiling to save you constantly using a traditional level. Good runtime on the batteries but it's best taking the batteries out at the end of the day as I had it drain the batteries a few times. It would be better with a green laser so that it is easier to see but this is not a major. Awesome bit of kit, im thinking about investing in a tripod but they're abit costly. This laser has both vertical and horizontal lines and projects quite a way, even in day light. Also auto levels! Great tool for setting out kitchens easy to use and very robust. At £140+ it's great value for,money compared to other int he market that are far more expensive that do exactly the same. Great job for marking out kitchens and downlights. Although if buying again would go for the 3 line version as would make downlights so much easier. Very good laser. Brilliant for any type of job. The best lazer I've had by far. I use it most days for setting out spot lights and making sure back boxes are all at the same height. Great tool, can't believe how easy this thing makes setting out! Also the magnet is strong enough to attach it to the metal corner plaster beads, this makes setting it up very easy.